For us humans, a lot of on page website elements are quite easy to understand. But for web crawlers, it can be really confusing. One great example I can give is graphical content. In a recent blog we published about image optimization, I explained why images in a website need to be optimized for both Page Load Speed and SEO. In this blog, we relate more to the SEO optimization aspect. If you haven’t yet read that blog, let me give you a small background. Image optimization for SEO is as simple as putting alternative attributes to go with the images you upload on your webpage. Alt attributes are the information you provide – these include the alt text and image title – to help web crawlers understand what your graphical content is about. Similarly, structured data functions the same way. When web developers create the structure of a site, they format the content into an HTML code and this can be difficult for web crawlers to translate – this is where structured data comes into play. From a web developer’s point of view, structured data is a system of pairing names with specific values. If you don’t have sufficient back-end web experience, structured data may seem very confusing since it is very technical in nature. To help you understand, allow me to explain it in a simpler way. I’m assuming that some of you might be thinking “Oh, that’s easy,” while others more educated on web developing may be wondering what in heaven’s name I’m talking about (hopefully not). But just so everyone can see where I’m coming from, let me show you how I’ve come up with this comparison by referring to the image below. This is the result generated by the Structured Data Testing Tool – which I will tell you more about later in this blog – when I tried to assess the structured data mark-up of Bicycle for The Mind. The values displayed at the left side of the table are referred to as properties and the ones on the right are the item type. Similar to common nouns, the properties are the general categories, while the item type indicates a specific value similar to proper nouns. Seems simple, right? Of course, having a bit of familiarity on coding will give you a greater advantage. But even if you don’t have sufficient knowledge on how to implement the technical intricacies, knowing how things work and familiarizing yourself with the basics are always better than being completely clueless on the subject matter. 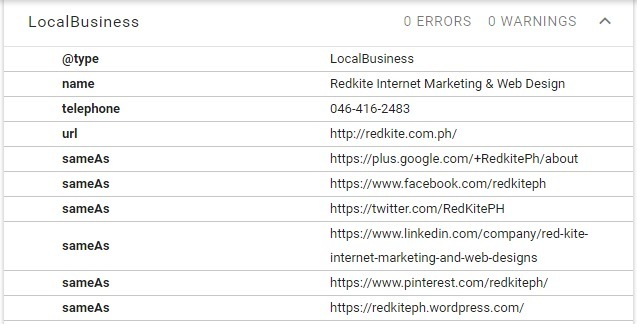 Side Note: If for example your website’s Content Management System (CMS) is WordPress, there are tools you can use to put structured data on your page without going through the hassle of coding it manually on the database. For a website to attain that kind of results, web developers use schema.org in making the structured data on a website. Google, Microsoft, Yahoo!, and Yandex are some of the major search engines that sponsors the Schema.org community. Schema aims to improve the web by creating a structured data mark-up supported by the major search engines. Using the schema vocabulary doesn’t necessarily mean that it will pull your page rankings up. This was clarified by Google Webmasters in this video. Even if that’s the case, it has its benefits which is why developers often use it in coding a webpage. To put it simply, with the use of schema.org, developers are able to come up with structured data that web crawlers can easily understand and index. 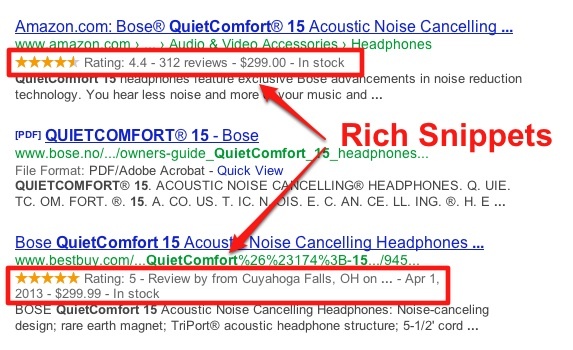 Useful Tip: A new search result format called Rich Cards can be implemented using schema.org. Applying this will make a website’s search result listing more eye-catching and easy to browse. To learn more about Rich Cards, watch this recent video by Google Developers about it. So what happens then when you have properly coded your website for structured data? This is the time good SEO works its magic. When you apply this on-page mark up, it allows search engines to better understand every bit of information that is displayed on your website. The data on your page that search engines classify as relevant information is then used to improve your business’s search result listings on the Google SERPs. When a website uses structured data, it has a better visibility on the search pages because of the rich snippets that could make its search result listing more enticing. This can lead to a higher click-through rate and give a positive impact on a website’s search engine rankings. If you’re looking for Beef Stew recipes what search result will you be most likely clicking on? If it was me, I’ll be choosing any of the two links on the first image. It already provides additional information (reviews, preparation time and calories) compared to the second one that doesn’t display anything but the image. Note that just because your website has structured data doesn’t mean it can automatically boost your website’s ranking. 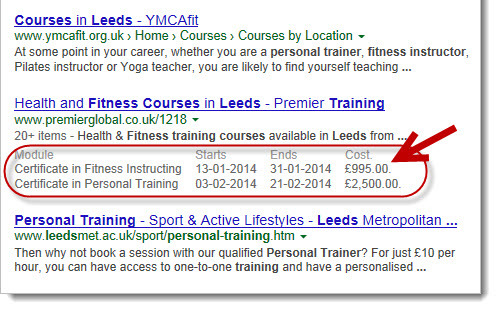 It still depends on the search engines if your mark-up data will appear on your search result listings or not. Most web developers consider it as a standard operating procedure to help search engines verify the purpose of a page. Basically, those two are the same. The only difference is that Structure Data Mark-up Helper allows you to put additional information on your website. In Structure Data Mark-up Helper, you need basic coding knowledge and an understanding of how the schema vocabulary works. Like what I have mentioned earlier, this tool gives you additional options to mark-up more data on your page. This is the first thing you’ll see when you use the tool. 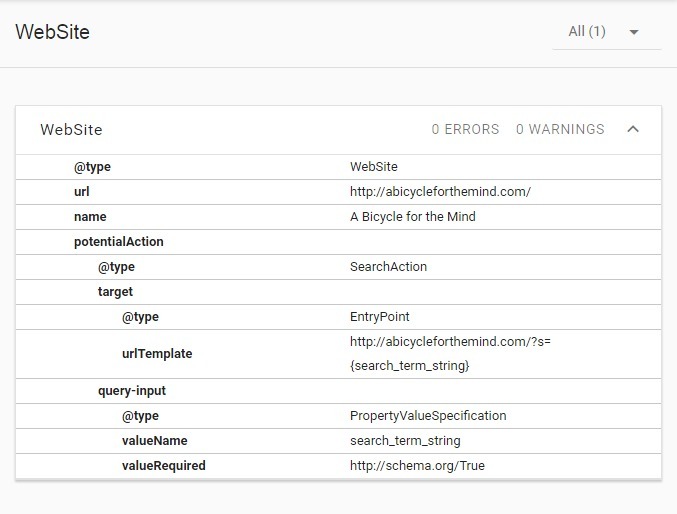 Simply select the data type and input the URL of the page you want to code for structured data. The generated HTML code provided will help you edit your website’s HTML source. The highlighted text serves as your guideline. After implementing the changes, make sure that Google understands your mark-up by using the Structured Data Testing Tool. This article about Structured Data Testing Tool can help you utilize it more effectively for your website. The next option you have is the Google Highlighter Tool. Watch this video to familiarize yourself with how the tool works. If you’re not that technically familiar with codes, using this tool is actually your best option. The features offered by Mark-up Helper us more advanced which can help you code your website better. Knowing how things work inside the hood of your website is a great idea. 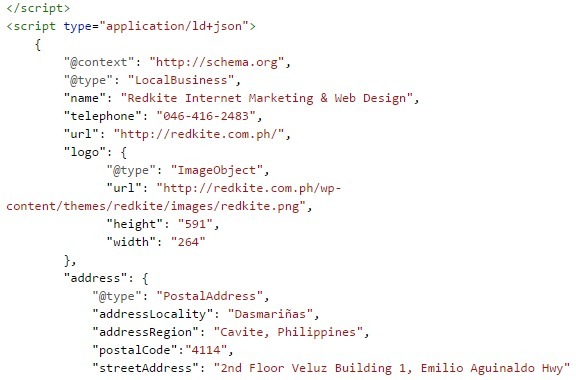 But you can always seek for an experienced developer’s assistance or a digital marketing expert in the Philippines. This way, you can focus on your business rather than waste your time on the complexities of microdata implementation.